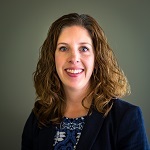 Ronald McDonald House Charities Maryland is pleased to announce that it has hired Kimberly J. Fusco, CPA as its Director of Finance and Administration. In this newly created position, Kim will handle the daily financial operations of the House and be a strategic-thought partner. Kim joins Ronald McDonald House Charities Maryland after many years at Ellin & Tucker, a prestigious Baltimore accounting firm. At Ellin & Tucker, Kim was chair of and helped grow the firm’s Not-For-Profit Services Group, as well as the not-for-profit area of the firm’s Accounting and Auditing Technical Standards Committee. In this role, Kim handled all aspects of accounting and tax services for her clients, and she is also proud to have founded the firm’s Giving Back Committee, which supports local non-profits through volunteer activities and fundraising events. Kim is a professional member of many national and local organizations including the American Institute of Certified Public Accountants, as well as the Maryland Association of Certified Public Accountants, and she is President of the Board of Directors of Disability Rights Maryland. She is also the proud recipient of numerous awards including the United Way of Central Maryland’s Philanthropic 5 Award, and The Daily Record’s Leading Women and Very Important Person Under 40 Awards. Kim is also considered a local thought leader and has been asked to participate on local business panels and share best practices for the not-for-profit sector. She lives in Halethorpe with her husband Ben and two daughters. Kim has been involved with the Ronald McDonald House Charities Maryland for more than 15 years and is excited to become a permanent member of the House’s team.